If you’re looking for a delicious way to use up fresh or frozen strawberries or blueberries, spring berry pie is the recipe you’ve been waiting for. Spring berry pie is so sweet and delicious. It’s the perfect taste of spring with a hint of summer. Perfect for Easter dinner, 4th of July and Thanksgiving! Strawberries and blueberries are actually summer berries in my neck of the woods. We pick them ourselves at our local u-pick orchards in our area. And while this pie would be even more delicious with fresh berries, it is just as delicious with store bought berries. So, I created this recipe when I was noticed the blueberries and strawberries we had been snacking on were starting to get just a little mushy. It was time to use them up. Plus, I had received this beautiful new pie pan that I was dying to use. I decided to make a pie that was sweet, light and airy, just like the season of spring. The name “Spring Berry Pie” also comes from the way the pie “springs” back when the filling is set. This is how you know this mouthwatering pie is ready to devour. Ingredient list and Directions for making Spring Berry Pie – A Family Favorite! 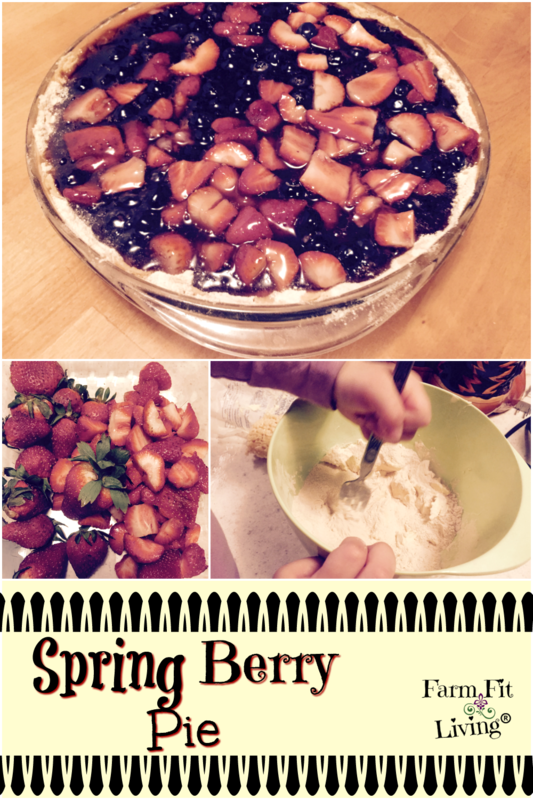 How easy this No-Bake Spring Berry Pie recipe really is. Tips for growing strawberries and other berries if you want to have your own fruit for this berry pie. You can! 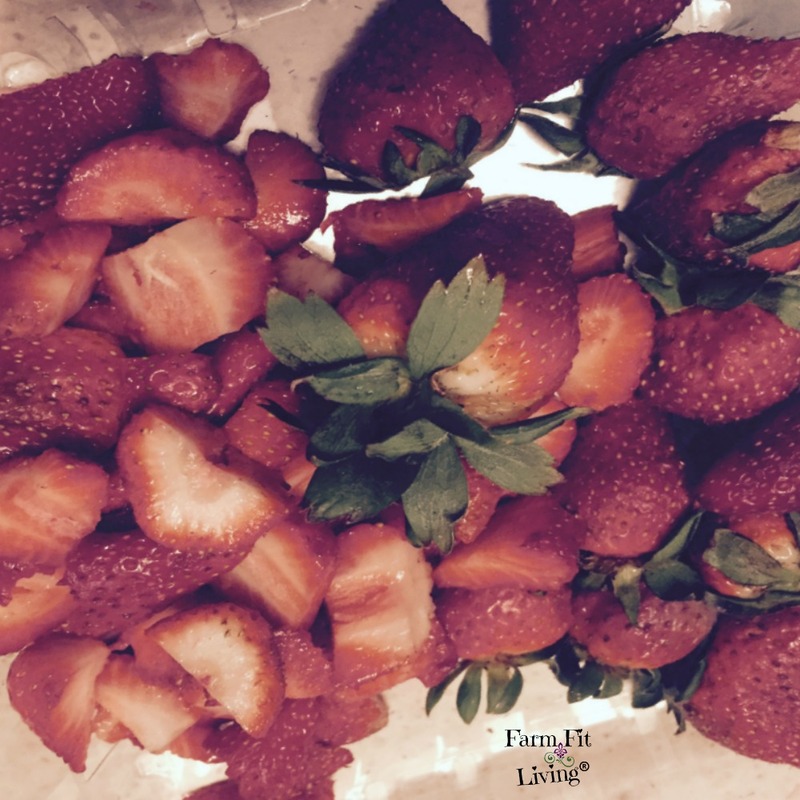 Now, let’s dive right in to the ingredients you need to make this mouthwatering “springy” berry delicious treat the whole family will love any time of year. 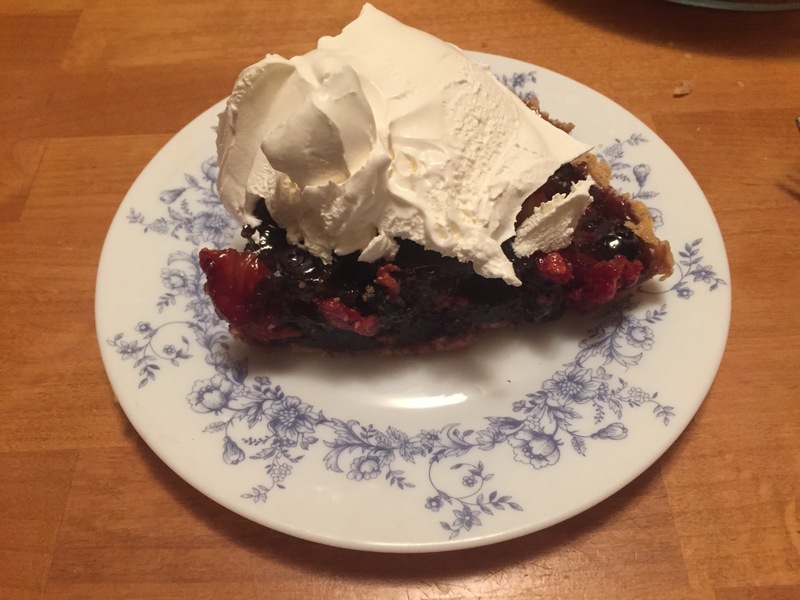 DISCLOSURE: THIS Spring Berry Pie Recipe POST CONTAINS AFFILIATE LINKS. THIS MEANS THAT, AT NO ADDITIONAL COST TO YOU, I MAY GET A COMMISSION IF YOU CLICK THE LINK AND MAKE A PURCHASE. THANKS FOR YOUR SUPPORT IN THIS WAY! 2 Cups Blueberries*If you are using a shallow pie plate, cut filling recipe in half. Feel Free to substitute other fruits or berries and jell-o’s. It’s fun to play around and use your favorite flavors. First of all, make the crust. Mix butter, sugar and flour together and press firmly and evenly into the greased pie plate. Bake at 375 degrees F. for 10 minutes. While the crust is baking, cut up strawberries into smaller pieces with a produce knife. However big or small you desire. In a sauce pan, combine water, sugar and corn starch. Mix well and bring the combination to a rolling boil. Remove from heat. Immediately add the Strawberry and Berry jell-o mix. Stir the jell-o mix in well until completely dissolved. Gently add the strawberry quarters and whole blueberries into the jello mixture. The mixture should produce a thick filling. I made this pie in the evening and by morning, the filling had set completely. It would have been ready to eat right then. After the pie filling is set, cover with a clear wrapping until ready to serve. Cool whip or some sort of whipped topping would be a great addition to the top of a piece of this spring berry pie. I’m not really sure because I always prepare this pie to set over night. However, when I make jello, it usually takes about 5-6 hours or so to set in the refrigerator. Therefore, I would recommend at least 6-8 hours for the jello in the spring berry pie to set and spring back. Why more? Well, because of all the produce in it. I’m not sure if it would take the jell-o more or less time to set. So, let’s play it safe and just allow plenty of time. You don’t want anyone to go hungry! I highly recommend making this spring berry pie the night before. Then, setting it into the fridge for the night. Now, you have a delicious spring-y pie to eat any time of year. Let’s talk about growing that fresh produce that is in the pie. Anyone can grow strawberries for this pie. They are very easy to grow. Strawberries can be grown in containers, barrels, raised beds or gardens. In fact, strawberries grow amazing in a higher spot, such as a raised bed. It takes a couple of years for strawberries to produce fruit. They need to be established in their location with proper nutrients and care. Wherever you choose to grow strawberries, you need to make sure the loamy or sandy soil is well drained. Strawberries do not do well in soil that is way too wet. Luckily, the sandy soil does not hold water as well, so this soil type is very ideal. If you’d like to learn more about growing your own strawberries, check out this publication. Note that it is appropriate for my own state, but may not be ideal growing and care conditions for yours. This depends on the variety you choose to grow for your area. For information on growing strawberries in your area, check with your local Extension office. So, when are strawberries ready for harvest? In the summer time. But what should you look for? Let’s begin with berry color. Strawberries can be green, white and red. The baby strawberries are first green. Then, they turn white. When the strawberries turn red, they are completely ready to pick. They should also be firm to the touch. Finally, you should really pick them with the green cap or stem on. Why? Because it protects the top of the fruit and maintains the fruit longer. Also, berries should be picked every other day at least. If the weather in the summertime is hotter than the dickens, you may need to be out there daily picking those berries. Why? Because the fruit will mature quicker in the heat and become squishy. Luckily, there’s a solution to having to be out in the heat. One other tip for harvesting strawberries is to pick them when it’s cool. This is actually better for the berries because you can quickly put them in a cool place to keep them from maturing too quickly. Here’s some more tips for growing strawberries plus some strawberry nutrition facts! In conclusion, strawberries need to be kept cool. I recommend to pick them very quickly, get them into the kitchen and put them into the fridge or freezer. Most berries are similar like this. Especially blueberries. So, let’s talk about them. On the other hand, growing blueberries can be a tricky endeavor if the soil isn’t just right. Blueberries love an acidic soil, which is different than most crops. I tend to outsource my homegrown blueberries to other local growers who actually enjoy growing them. So, instead of growing my own blueberries, I actually enjoy going elsewhere for my fresh blueberry supply. Here’s the run down on how I still get to pick my own fresh blueberries. In early July, blueberries are ready in our area of Kansas. I love going early in the morning to my favorite U-Pick blueberry patch near our homestead. I pick all I want to take home and either eat or freeze. Not only am I getting fresh blueberries for my family but I’m supporting a backyard business in my community. And we all know how important it is to support back yard businesses in rural communities. Or any community for that matter. You can’t grow EVERYTHING. And you shouldn’t. With any business or lifestyle, outsourcing is excellent for balance. Berries require a lot of care. So, give yourself a break and support someone else’s. Supporting backyard berry businesses are so important to keep in your local area. When you support them, they stay longer. If someone has this type of backyard business, they must have a true passion for it. Go there and feel their passion in the quality of the product. Local is healthy and cheaper. U-Pick places allow you and your family to visit and pick your own produce. Without the work involved of caring for the plant. And berries are an essential part of my family’s diet. We eat berries and fruit in many ways because it’s healthy and they are delicious in snacks and desserts. One of those is the spring berry pie recipe I just shared with you. 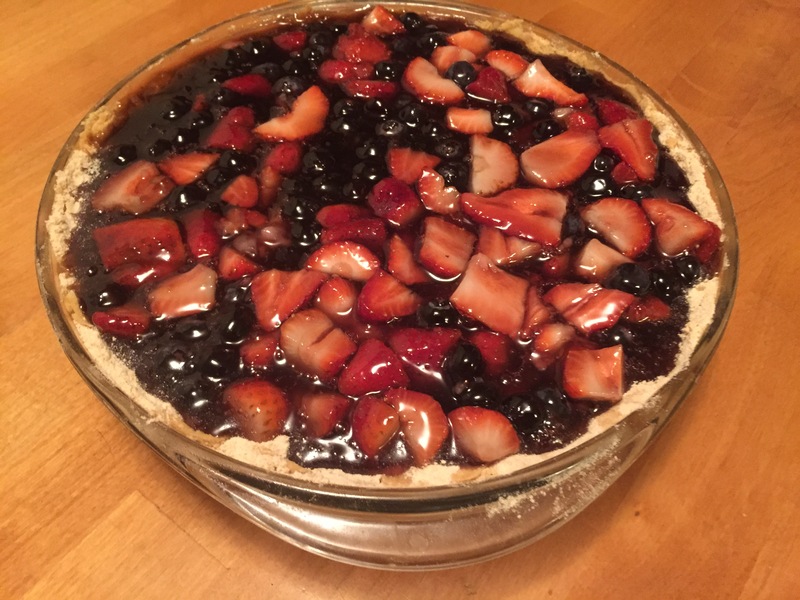 So, I hope you support some local berry businesses and try this pie for yourself! Although these berries are ripe and fresh in the summer, they can be frozen or bought at the grocery store. This means you can enjoy this pie all year long. If you need a fun and delicious dessert to share at any gathering, look no further. Finally, this yummy pie is a sweet and nutritious way to bring the warm and sunny back into any meal. This looks delicious. I always find pies intimidating, (I don’t know why) but I could definitely handle this! Thank you, Emily! I also don’t bake pies too often. This was very easy to make. I actually made it about 9:00 at night, so I was already tired. But I got it done! The berries and jello mix make a yummy combo. I hope you love it! This sounds like a scrumptious recipe!! I will have to try it will jello next time. Great, Caroline! I hope you love it! Enjoy! I went out and checked on mine today and they are looking great! I planted them last year – so here’s to hoping they produce this year, so I can make pies pies pies! Oh my heavens – this looks amazing!!! !